The second Christian Training book for spiritual maturity reveals how Christians can have overcoming, unshakable faith in Jesus Christ that will improve their Christian conduct. The scriptures will be made more understandable, and you will discover a deeper truth, as the points are verified by scriptures. People will receive spiritual counseling along with their expanded education in the Bible Studies. Victorious Faith in Jesus Christ, addresses subjects that are currently roaming around in Christians minds and going unanswered. They will be addressed and thoroughly clarified with satisfying answers to each question. Here are a few of the subjects that are addressed in this second book in the Foundational Faith in Truth Bible Study books. Â· What Happens When You Compromise Your Integrity? Â· What is the meaning of life? Â· What is Revelation Truth? 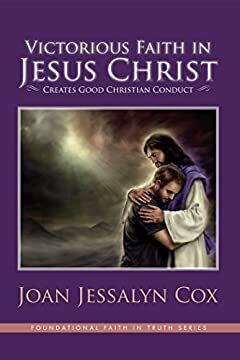 How does it change Christian Conduct? Â· What is Moral Protection? Â· What is Good Christian Character? Â· What is the Truth that sets you free? Â· How do you develop good Christian Character? Â· What are Spiritual Life Skills? Â· What is the Key to Change that will help Christians to be a More Credible Witness for Jesus Christ? Â· What is the Purpose of Individuality in Christians? Â· What are the Blessings Promised to Followers of Jesus Christ? Â· What is Spiritual Discernment? Â· What Happens When You Trust the Untrustworthy? Â· How do you Move away from a guilty or sin conscious to have a good conscious, and how does each type of consciousness affect your life? All the previous questions are thoroughly and clearly explained in our second book in the series.